I found this Baldor 2 hp three phase motor on Kijiji (Kijiji is a classifieds website like Craigslist) for $40. The first photo from original ad. I took my multimeter with me and checked the motor leads. All phase-to-phase resistances were equal at 2.5 Ohms and high resistance to ground. The shaft was not seized so I took it home. I cleaned it up and shot some new blue paint on it. After hooking it up to a VFD on the test bench I noticed the motor had an audible knock when sweeping through the 30 to 40 Hz range. Sounds like some new bearings are in order. 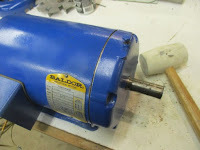 On some motors the bearing models are listed on the motor nameplate. The nameplate may have a DE (Drive End where the pulley goes) and an ODE (Opposite Drive End) followed by the bearing number. 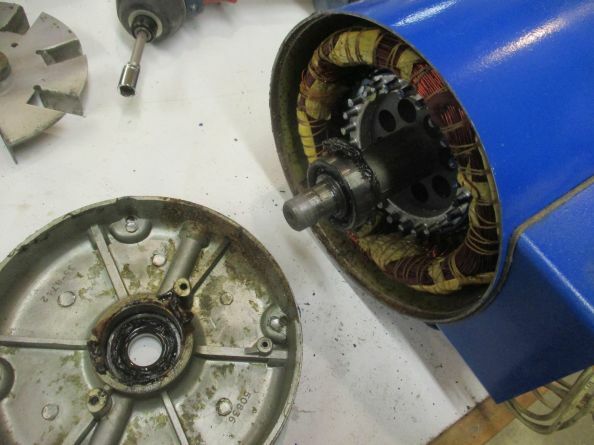 This is not the case with this M3558T motor. 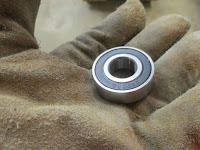 I did however find the bearing sizes on the company's web site. 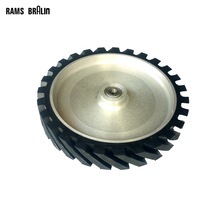 https://www.baldor.com/catalog/M3558T-9#tab=%22nameplate%22 listed as DE and ODE. 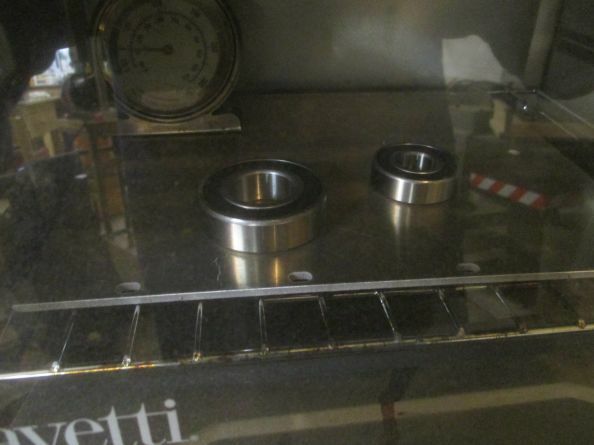 The Drive End and Opposite Drive End bearings are 6205 and 6203 respectively. Materials: 6205-2RS and 6203-2RS bearings, $5 each. 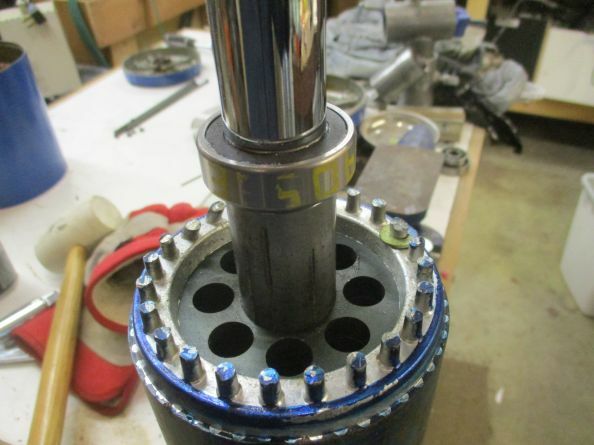 Deep socket set, or short section of 1" pipe. 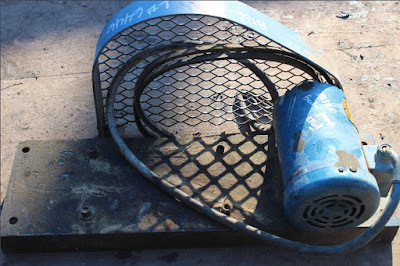 Shop supplies, rags, spray lube, gloves etc. Take the fan shroud off. Three short screws are holding it to the frame. This exposes the external fan. 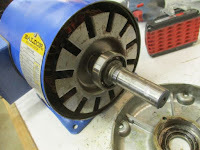 Loosen the set screw on the collar and slide the fan off the motor shaft. Take all four bolts out. 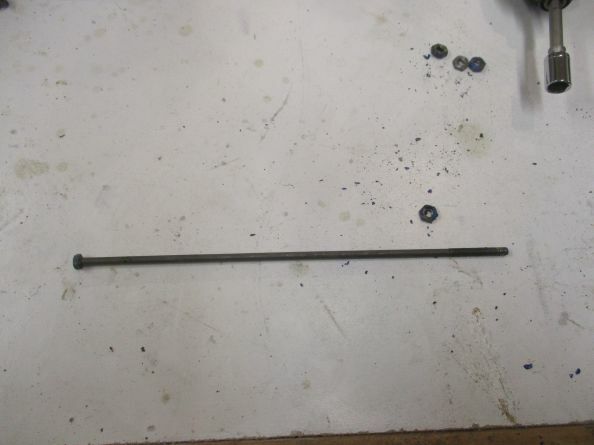 These are long screws and they may need a tap with a mallet to get them to slide out of the frame. A gentle tap on the bell will cause it to separate and come off. That's the old bearing. Note inside the bell there is a wavy washer. Wipe the grease out and inspect that it's not cracked or broken. 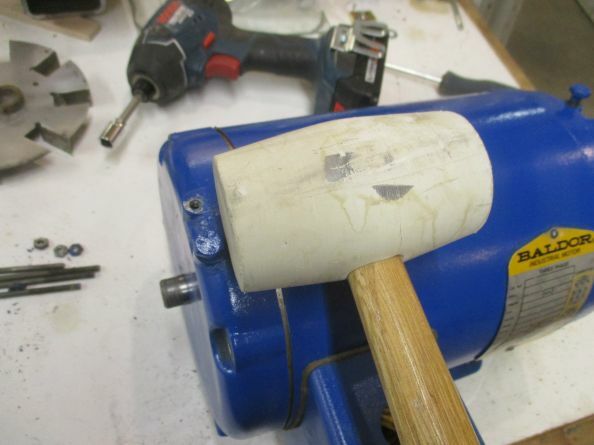 Nudge the front bell off with a mallet. Clean the grease off the bearing and carefully slide the rotor out of the stator. On the bench I used a 3-jaw 4" puller to pull the bearings off the motor shaft DE. There is a noticeable "pop" when the inner race breaks free of the shaft and then it slid off quite easy. 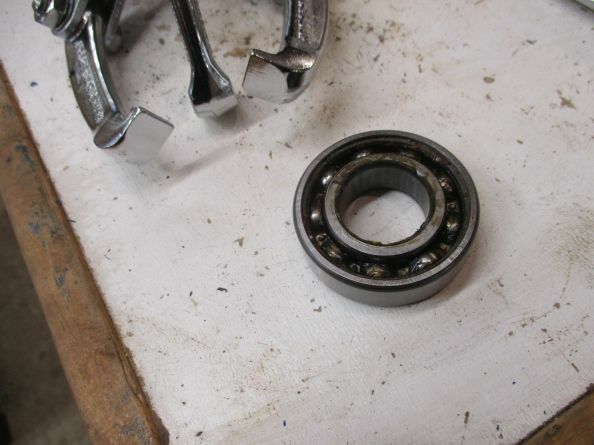 This is a 6205 bearing. It is unsealed and can be lubricated from the top of the motor. After much research, I opted to go with 2RS (2 Rubber Seals) version of this bearing. The 2RS is sealed, but has a lower temperature rating. 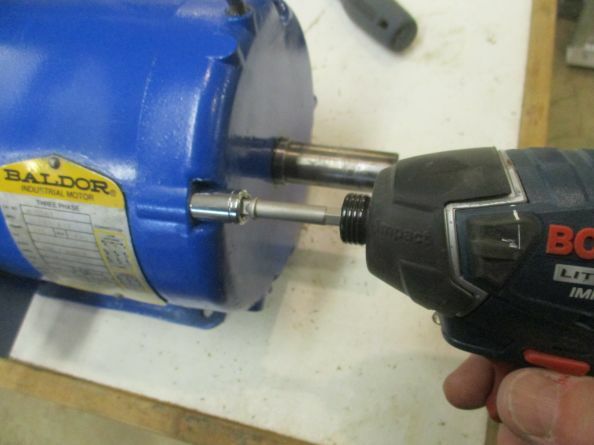 Pull the ODE bearing off the motor shaft. This is a 6203 bearing. 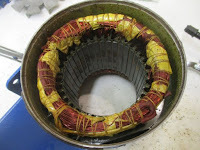 Inside the stator. Wipe with a clean rag. Hot bearing. 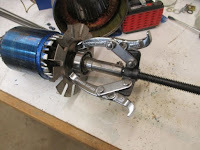 Handle with gloves. I cleaned the shaft and gave it a squirt of lube. Once the bearing is heading on straight, I used a deep socket and hammer to tap the bearing up to the shoulder. It stops when it hits the shoulder so no guesswork about where it goes. 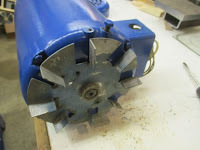 I flipped the rotor over and put the 6205-2RS bearing on the Drive End. 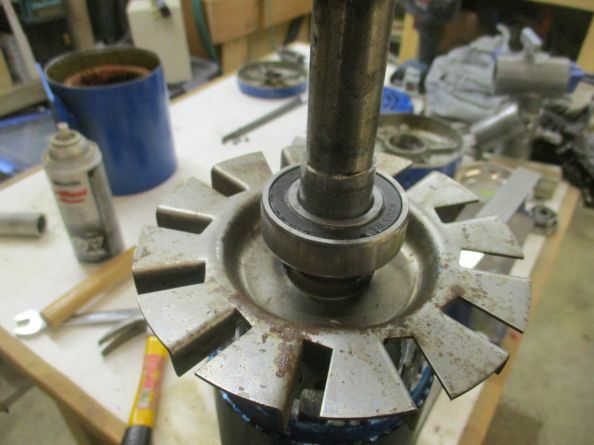 Slip the rotor inside the stator and put the rear (ODE) bell in place. 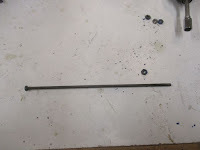 The long bolts start from the rear and slide through the space between the outer frame and windings. 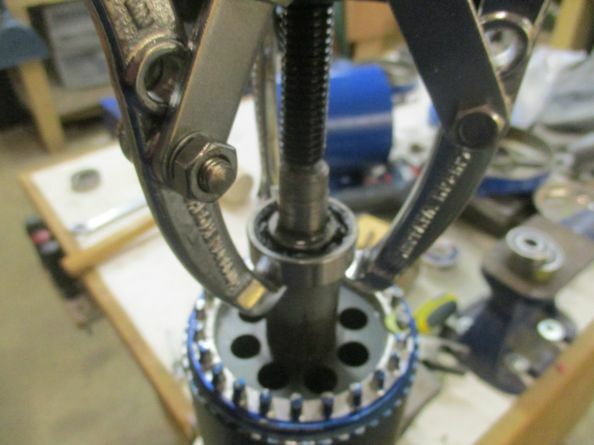 There are four of these gapped areas to slide the bolts through. 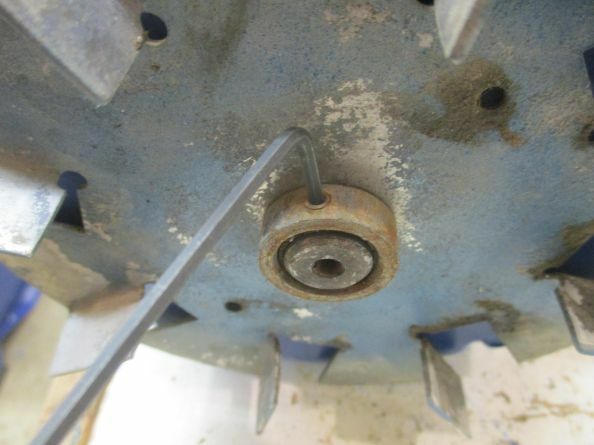 If some persuasion is required the rubber mallet works great, but try not to damage the last 1/2" of threads as this sticks through the bell and will need the nut threaded back on. Some gentle nudges and the bells are fitted. Put the nuts on the long screws and torque to about 40 inch pounds. (screw driver tight). 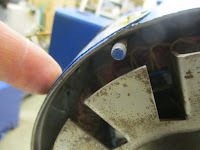 Reattach the external fan and collar. Re-attach the fan shroud. Over to the bench for testing and this baby is smoothing and quiet throughout the 0 to 120 Hz range. 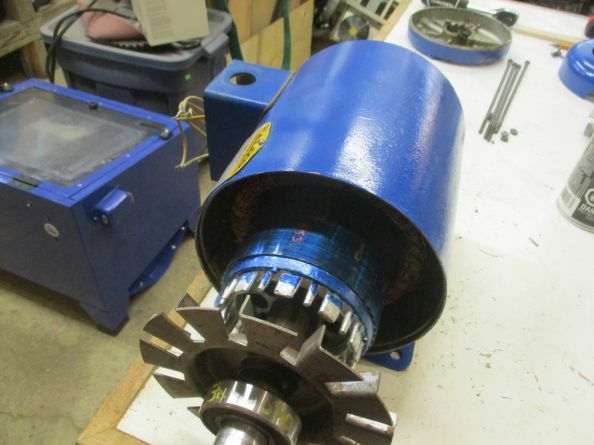 This is a great way to keep a perfectly good motor in service for years to come.